Creating a consistent, holistic customer experience across all channels is becoming a valuable capability for Kiwi retailers to future proof their business. Think about your own life: you work with all sorts of digital-connected devices – it’s your smart phone, your tablet, your desktop, it’s everything. TVs and game systems, even appliances like refrigerators, are getting connected. And these devices will all become shopping devices. These fundamental changes in how consumers interact will also transform how they transact. We are seeing that the convergence between the digital and physical is radically altering the day-to-day shopping experience and habits of consumers, and blurring the lines between online and offline commerce. Consumers will now shop and pay in whatever way best fits their needs and lifestyles, from every device they have, in the aisle, at home, on the go. In a recent MasterCard survey, over 60% of people between the ages of 18 and 34 wanted to use a mobile phone for purchases. With this convergence, merchants and retailers are at a pivotal moment in time. While we are seeing some retailers embrace the commercial opportunities provided by online, there is more to do in utilising the benefits of digital to integrate ‘bricks and mortar’ with the information-rich experience of ‘omni-channel retailing’. Omni-channel retailers look for ways to ensure they can connect with their customers across all of their channels. Their customer can buy online and pick up in-store, or use mobile in-store to research or make a purchase, or they can buy in-store and initiate a return online. In order to rise to the challenge of creating an omni-channel experience for the discerning Kiwi consumer, retailers should focus on the customer experience from a holistic perspective, and then decide the role that digital will play. The first step is to be proactive in experimenting with different technologies and service models. In the dynamic and evolving environment we live in, sitting on the bench until an optimal strategy becomes clear will have you waiting a very long time. Kiwi retailers should be to attempting to understand how their customers are using physical and digital environments to help them make purchasing decisions. Social media, customer reviews and feedback, and increasingly personalised shopper profiling can be incorporated to enhance the shopper experience and create the 360 degree approach to retailing that consumers are demanding. Social media has become one of the most effective ways to sell something, and retailers should be making full use of peer-to-peer communications. We’re also seeing retailers integrating customer reviews online and using digital means to personalise physical shopping. As technology advances, businesses will be able to offer more detailed, personalised shopping recommendations. In some cases, retailers are bringing the online shopping experience into the store, extending the POS and eliminating checkout queues. But in the same way, retailers must be prepared for the customer who wants to scan a barcode in the aisle, ask the merchant to ship it to his/her house, and then walk out of the store. They must also understand shopper behaviour and find out what drives their customers during their shopping experience – from start to finish and across channels – to better engage them, enhance the customer experience and increase brand loyalty. Creating a consistent, holistic customer experience across all channels is becoming a valuable capability for retailers to future proof their business. 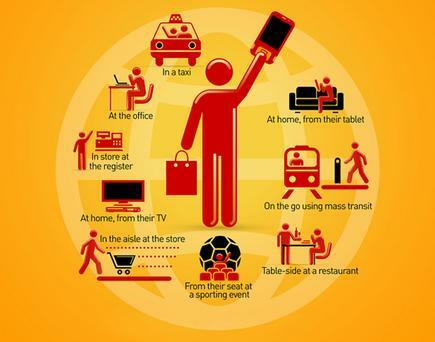 The evolution towards an integrated physical, digital, mobile and social shopping experience is just getting underway. Retailers need to enable a seamless shopping experience across all channels by integrating services, technologies and processes to give their customers a rich and engaging experience. Next week's article will take a closer look at how mobile wallet platforms are helping drive the adoption of digital payments technology.